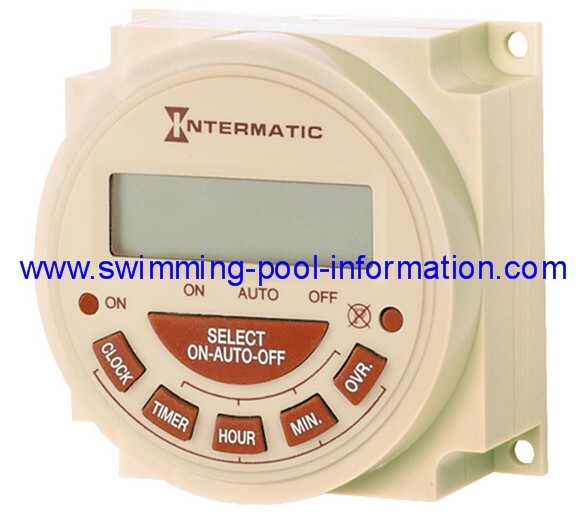 Here are two Intermatic swimming pool pump timers. The yellow face dial is what most people probably have in their backyard.....below that is a digital timer that fits into same box. The Intermatic digital timeclocks are three times the price of one mechanical timeclock mechanism, but well worth it! 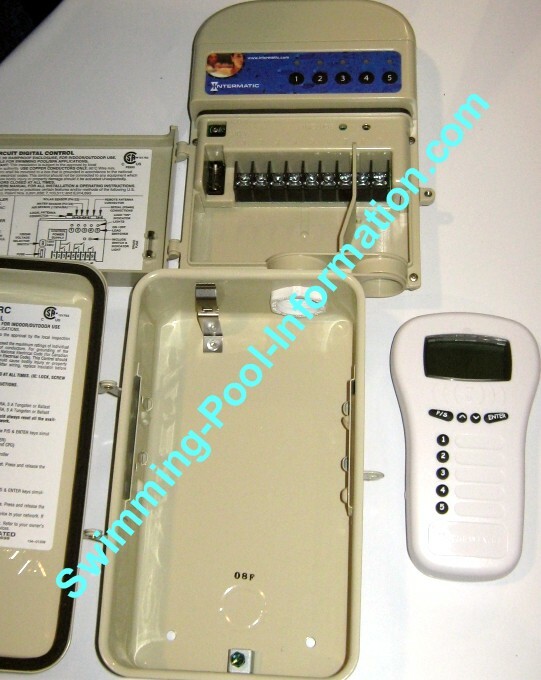 The model pictured above has three circuits for three separate devices or a two speed pump and another device such as a colored LED pool light or a pool sweep booster pump motor - no need to ever have to worry about your pool sweep booster pump timer getting out of synchronization ever again! Another fantastic feature of the digital version is the built in "fireman's switch" which automatically shuts down the heater a few minutes before the pump shuts off. (The amount of "cool down" time is programmable.) Also, if you manually turn on the timeclock to use the spa, when you are done and shut off pump, the heater will shut off and the pump will run for a few minutes longer to cool the heater before shutting itself off...not only is cooling the heater down good for a longer heater life, on older heaters with cast iron/bronze headers the remaining heat trapped in a heater when the flow of water is suddenly shut off can damage PVC pipe. 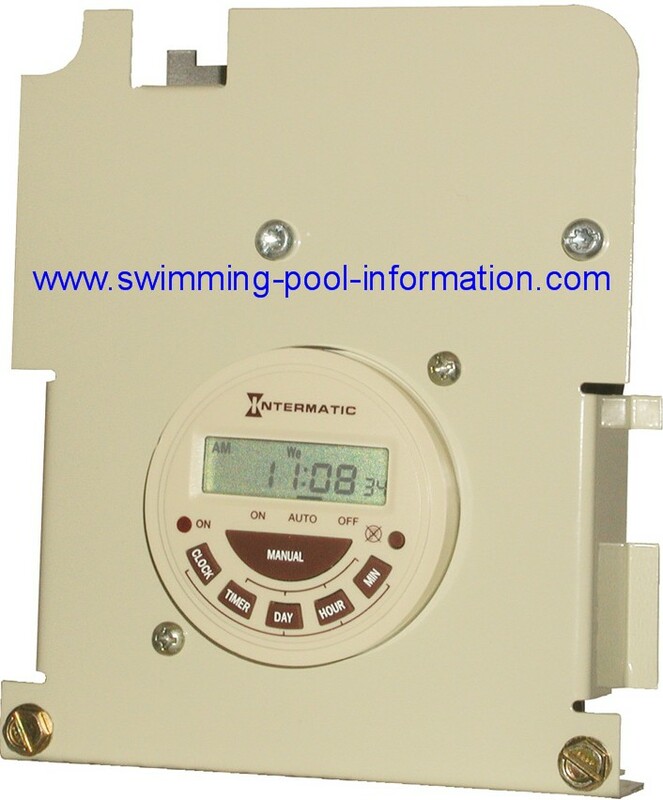 The mechanical clock at top above also has an optional fireman's switch that only works in timeclock mode.....for example, if you were to manually turn on pump from timeclock to use spa, you would still need to shut off heater 10 - 15 minutes before turning off pool pump timer. However, if you only have one pump and a pool with no attached spa, this less expensive option could be for you. Also the buttons on the digital version are plastic instead of metal VERY handy when your hands are wet! There are digital copy cats out there but some only offer two circuits and/or no fireman's switch. The only negative thing I can say about the digital version is only one side of the circuit is opened by timer. 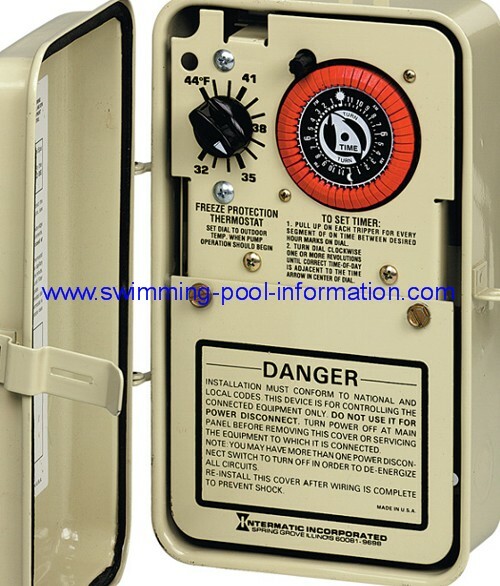 What I mean to say by this is if you have a 230 volt system, one side of motor will always be "hot", so if any device controlled by digital timer is being serviced or the filter tank is being cleaned out with water, the power needs to be completely shut off by a manual switch or the breaker. 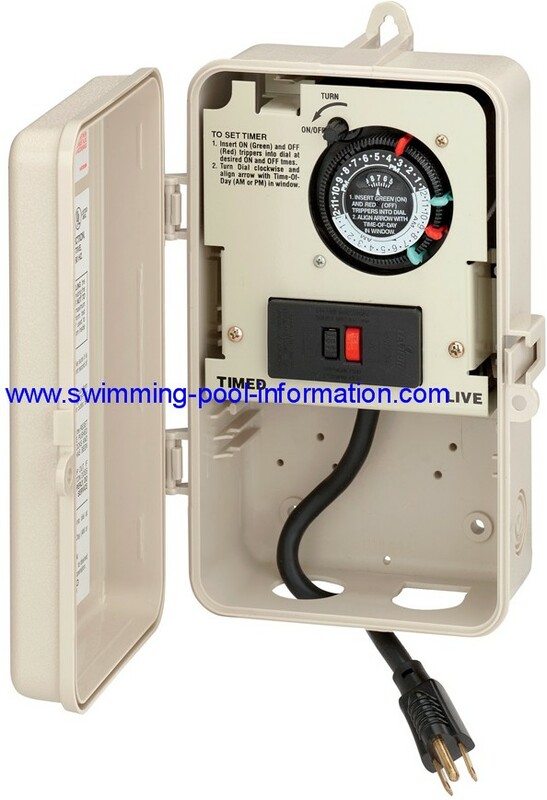 Of course if you have a new pool man you should alert him to this (when I first started servicing swimming pools I had no idea that some 220 motors and/or other devices such as electronic heaters had one side of circuit always "hot"). On the other hand, if you do not much care for your pool man, mums the word! 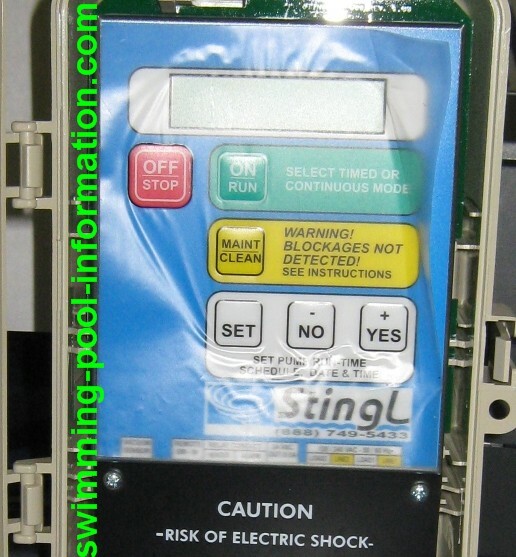 The unit above is the Intermatic Multi Wave Controller...it has wireless ability and can control 2 speed/multi speed pumps and also up to 5 pieces of equipment. Also the hand held wireless controller can also control garage door,landscaping lights, indoor lights,etc. Below is a timer with freeze protection to keep pump running on colder days to avoid plumbing damage. Below that is a timer with built in GFI protection. The large photo is a digital replacement timer that fits in same box as the timers at the top of page. It has less features and also is less expensive than the digital timer at the top of page. The other photos show a wireless control version with a different style box and also a version for a portable spa. 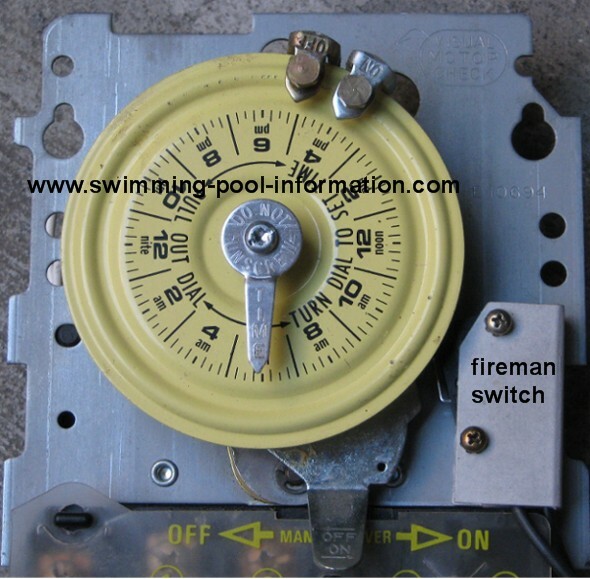 I could probably devote a whole website to various controls but here is a few of the most common pump timers that are easy to install/replace. I also have more info/photos in the controls section. If you would like more information, or to purchase a timer, hit the "contact me" button! 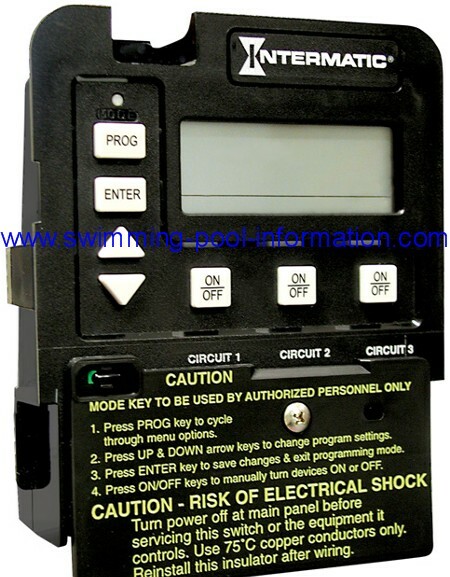 Also, the links below will take you to a page with more types of digital controls and also a page on timeclock problems.